Moving tracking numbers between subaccounts in the same agency can be done by an agency administrator. Moving tracking numbers between accounts or subaccounts that are not in the same agency must be done by a member of our support team and requires approval from the highest-level administrators on both accounts (an agency administrator if applicable, otherwise an administrator). Transferring call data along with the tracking number is optional. However, once call data has been dissociated from a tracking number, it cannot be re-associated. Navigate to Numbers → Tracking Numbers. Click All Accounts in the upper right corner of the tracking numbers list. This page will show a list of all numbers for all subaccounts in the agency. Scroll or use the search bar on this page to locate the number you wish to move. Click change account in the red Accounts column next to the number you wish to move. Use the drop-down menu to select the subaccount you wish to move the number to, then click the red checkmark. A confirmation window will appear showing which number will be moved, the subaccount it will be moved to, and the receiving number and tracking source it will be assigned to when moved. Review this information for accuracy. By default, the option to move call data with the number will be checked (call history will be moved with the number). If you do not wish to move call data, uncheck this box now. The tracking number will now be moved to the new subaccount you have selected. You may need to refresh the application or log out and back in to see this change. Call data may take up to several hours to transfer between subaccounts, especially if there is a significant amount of call history. To move numbers between accounts that are not in the same agency, you will need to contact our support team. Requests to move numbers must come from an agency administrator and must also be approved by an agency administrator of the other account. If the account does not have an agency administrator, requests or approval can come from the account administrator. Find the name and account ID for the account the number is in and the account it will be moved to. These details can be found in the Settings menu in the upper right corner while viewing the account or subaccount. Find the name and login email address of an administrator or agency administrator from the other account. An admin from each account must give their approval before tracking numbers can be moved. Decide whether the call history should move with the numbers. Moving call history may take some additional time. Once call history has been disassociated from a number (by moving the number without its call history), it cannot be restored. If you choose not to move the call history with a number, it will not be deleted from the original account. 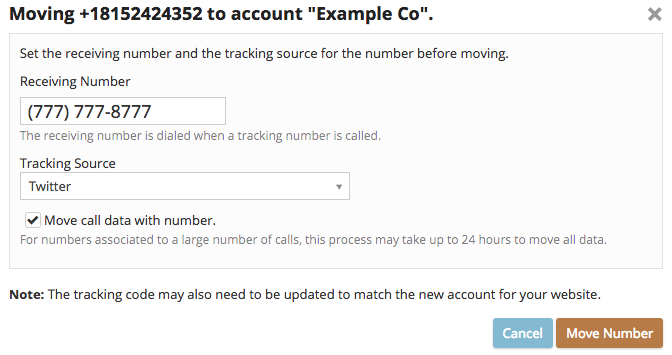 Use the support contact form or send an email to support@calltrackingmetrics.com letting us know the account ID the numbers are currently in, the account ID they will go to, which numbers should be moved, and whether you would like call history to move along with the numbers. This request must come from an administrator or agency administrator. CC an administrator or agency administrator of the other account so that they can respond to let us know they approve the number move. Approval for transfers must come from an administrator or agency administrator email address in a CallTrackingMetrics account. Our support team will process the request and send a confirmation when the transfer has been completed. Once the number has moved, we recommend you review the call settings and routing for the moved numbers. You may need to refresh the application or log out and back in to see the numbers and call history appearing in your account. Call data may take a few hours to transfer over for numbers with a significant call history.